In a world of finite resources and growing population, the traditional “take-make-dispose” economic model is increasingly unsustainable. As a consequence, companies are feeling pressure from customers, NGOs, regulators, and investors to rethink wasteful linear value chains. The “circular economy” envisions a more regenerative alternative focused on a “refurbish-repair-reuse-recycle” model that has the potential to sustain global growth in the face of increasing resource scarcity. 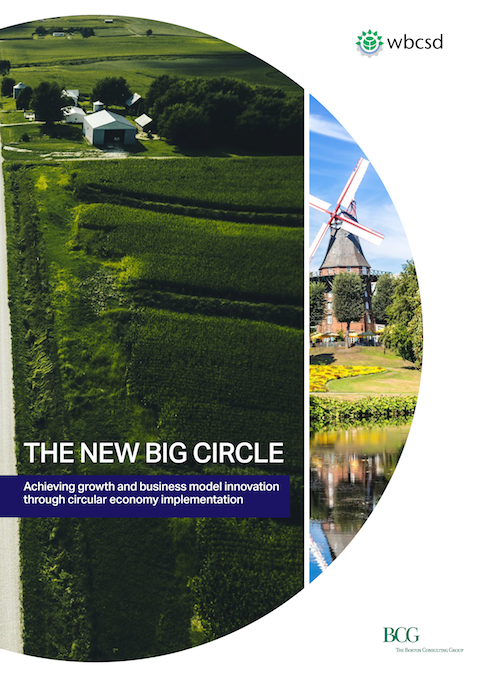 The Boston Consulting Group (BCG) and the World Business Council for Sustainable Development (WBCSD) joined forces to offer practical guidance for organizations seeking to successfully transition to the “circular economy.” Their report—“The New Big Circle. Achieving Growth and Business Model Innovation through Circular Economy Implementation”—is the result of a research effort that included a survey of 78 managers from different industries across the globe and one-on-one interviews with leaders to understand best practices on how leading companies are making the circular economy come to life. Given that, it is not surprising that 84% of respondents stated they expect to increase their investments in circular economy projects in the future. The report argues that the circular economy journey should be tackled in three stages of increasing complexity: first via process innovation, then product innovation, and finally business model innovation. Thirteen case studies of leading companies achieving growth and enhanced competitive advantage as a result of circular initiatives—AkzoNobel, C&A, CMPC, Cohealo, GreenHome, Hirdaramani, IKEA, LafargeHolcim, Michelin, Philips, Rubicon, Skanska, and Solvay—offer concrete examples. The Boston Consulting Group (BCG) is a global management consulting firm and the world’s leading advisor on business strategy. We partner with clients from the private, public, and not-for-profit sectors in all regions to identify their highest-value opportunities, address their most critical challenges, and transform their enterprises. Our customized approach combines deep insight into the dynamics of companies and markets with close collaboration at all levels of the client organization. This ensures that our clients achieve sustainable competitive advantage, build more capable organizations, and secure lasting results. Founded in 1963, BCG is a private company with offices in more than 90 cities in 50 countries. For more information, please visit bcg.com.